Andreas Ganstaller moved his operation from Brauerei Beck Trabelsdorf to Schnaid-Hallerndorf in 2011. He retained his recipes from Beck, and some equipment, and renovated the interior operations of the old Friedel brewhouse. 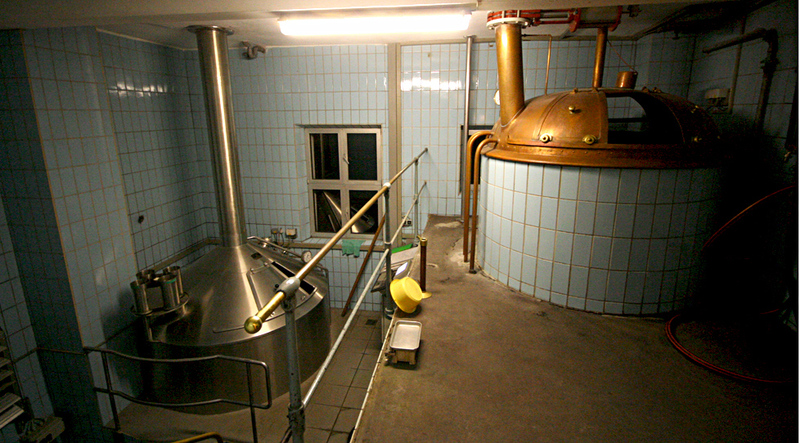 But the new Gänstaller-Bräu in Schnaid could not accommodate the drinking public. For that, Andreas and wife Manuela opened the Zoiglstube Drei Kronen Strassgeich 25 km to the east. 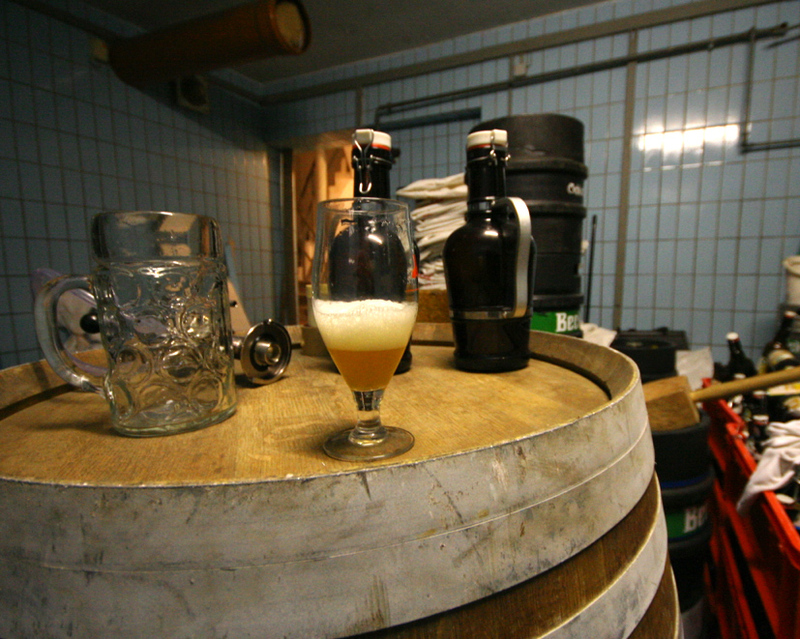 The operations at Gänstaller-Bräu in Schnaid provide a peek into the brewing operations of a man many consider to be the best brewer in the world. His bock and Doppelbock strength lagers are thrice decocted for a rich melanoidin savoriness to go with whatever hop concoction is imagined. Known for experimental collaboration beers with the likes of De Molen, Birra del Borgo, and Närke Kulturbryggeri, it seems even the strange recipes (Baltic Porter with New Zealand and American hops, Heller Rauch Doppelbock with German, New Zealand and American hops) are very precise in flavor and aroma, with the signature creamy body that few brewers achieve. 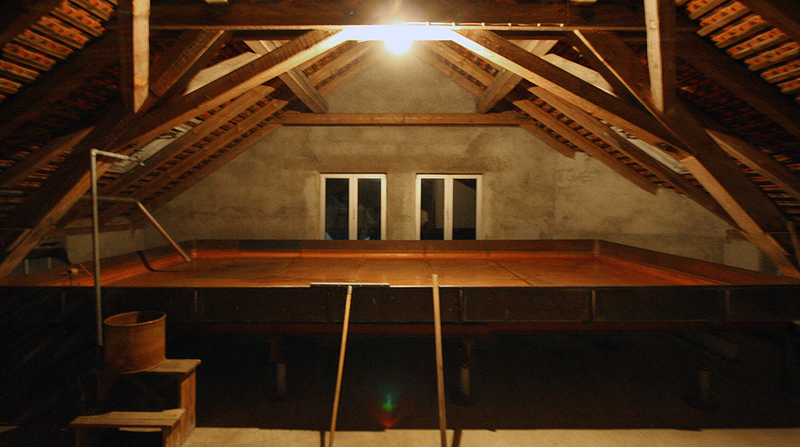 Andreas crawls in the cold barn across from the brewhouse, to pour from a barrel his 25° Plato Quator. This strong Doppelbock was intended to age in oak following two years in stainless steel, but the batch turned sour, and each keg had a slightly different infection level, depending on the amount of yeast filled in each. Andreas and I agreed that it was in poor shape, but that the sampling was a positive learning experience. I first tried Golden Smoked Zoigl at the Schnaid brewery in 2011 (drinking from the glass below) when it was lagered only 3 weeks. The aroma was one of the most amazing sensory experiences of my life. 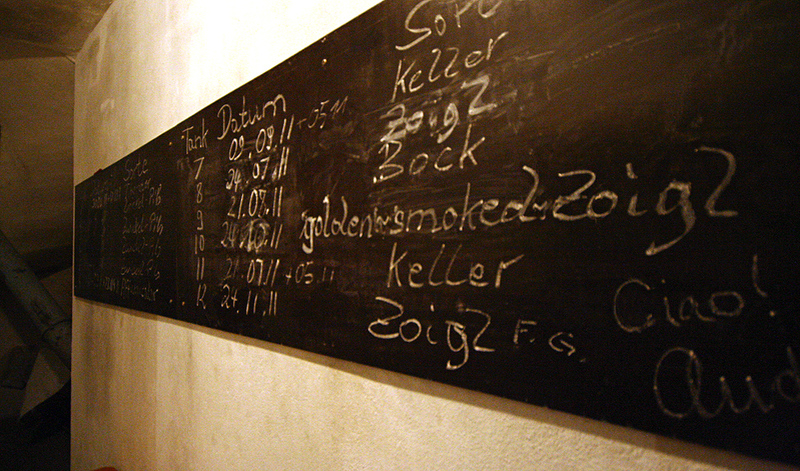 Two years further, with another batch served at the Zoiglstube, and later at the Fränkisches Bierfest in Nürnberg, it had conditioned for a full eight weeks, the aroma more intoxicating that can be imagined, and nearly impossible to put into words. How to qualify incredible sensory experiences? Consider in your own life, the richest aromatic-emotional experiences: countryside farmland after a thunderstorm; dank rainforest; fresh seafood on the grill; bread baking in Grandmother’s kitchen; standing over the pit while smoking a whole pig… That is the emotional response of a 5.0 sensory experience.